Mei In China: Monday in GZ Continues- Red Couch! Today we had to stay in our rooms until Noon, in case there were any questions about our paperwork from the US Consulate. If so, then we'd be called from our coordinators, who were at the Consulate's office. There is one unhappy person in our travel group. Things went badly for her in Nanchang in terms of smoking people being put in non smoking rooms. They smoked in their rooms, and the smoke drifted into t everyone's rooms. It's shared ventilation at Gloria Plaza, so if someone next door is smoking, you might as well be smoking. She is worse than I am about smoke, so she's angry and things are going badly for her. We saw our coordinator coming off the elevator. We said, "How are you?" She said, "I'll be happy when you guys go home." Our other guide, Jesse, is new to the job. We called her this morning when we didn't know where to take Juna. She's been following up with us ever since. She came by to see the baby, make sure we were ok. See, Jesse has not been driven nuts yet, as this is her first week. I am sure the frantic Americans can wear a poor Chinese coordinator down. Again, it's cultural. Americans rant and rave and want things done NOW. That is not the Chinese way. We have learned things run on Chinese time. Like the sit down restaurants. Don't go if you are in a hurry. Things move very slowly. And if you inquire about something- like one time Juna's congee was very late. Everyone had been served and halfway through their meal and she still hadn't gotten her congee. I asked very nicely and the waitress snapped my head off. Ok! That is not the Chinese way. The thing to do is alert a manager. They roam the restaurants. Tell them the problem and it's fixed immediately. You don't tip a waitress at a Chinese restaurant, did you know? I did not know that. So after 12 Noon, we met our friend Aler Young in the lobby. 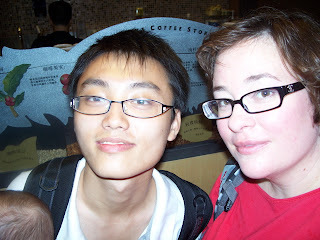 He was going to take us to see his university, but we only had 2 hours and it was a long subway ride away. I was looking forward to seeing a Chinese University! Oh well. Instead, we walked around the Island. Aler had found a must dine restaurant from his guide book. He's never been to this Island, even tho he lives in GZ. The guide book had must eat dishes, so we ordered the ones listed. It was a cute place. Very small, nicely decorated. The staff spoke a little bit of English. The food arrived very quickly and was quite good. The Drunken Chicken was a dish served in a pot of cold rice wine. That threw me off. Cold chicken, still on the bone. But good. Another dish was pork served in a glob of brown fatty material. The waitress cut it open and the pork inside was so delish. I have learned you serve your food into a bowl and eat it from the bowl. The plate you are given is for the bone yard. You are not given napkins, just sealed wet cloth. Today's smelled like fresh tea. They also give you a a packet of tissues if you want to wipe your hands on something. I keep those packs for the toilets. It's so hit and miss. Will you have TP or won't you? Oh, this restaurant had WESTERN TOILETS! ANd lots of them. Honestly, I've used about five Chinese toilets now and STILL cannot get the hang of the right "aim." HAHHA. Please note I witnessed another young and tiny Chinese woman purge her lunch in order to stay slim. It appears to be a big problem here. Which proves that even size zero women love to eat. "I'm just never hungry" is pure BS. 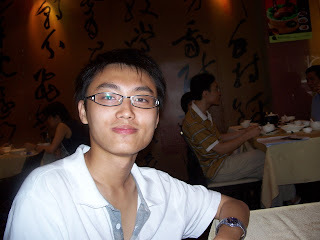 Aler Young, a university student from GZ. The lunch specials page. Note the prices are in RMB. Click on the pic to enlarge. And yes, they did have pigeon here, too. 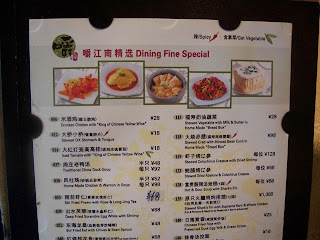 Most of the menus here are in English, too. STARBUCKS! From the hotel, walk down the Jennifer's/Lucy's/Name Your Shopkeeper street. Go to the end of the block. Make a right. It's the second store on the corner. 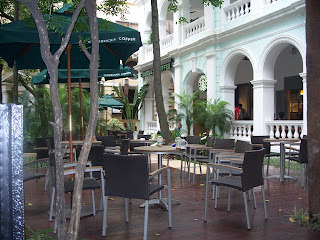 And it has this lovely outdoor eating area. It is located near a little park. A lovely area where the Americans stroll around. The staff in Starbucks speak English. We did not go to Cow and Bridge because it is Thai and we are not crazy about Thai food. Walking back to the hotel with Aler, we witnessed a photo shoot outside of Lucy's shop. Two very good looking men, shirts off, and modeling jeans? Shoes? Who cares. Probably the best looking men I've ever seen in person in my life. Italian, maybe? Longish hair. Smoldering eyes. 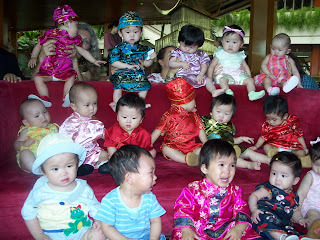 Young Chinese girls were gathered around, oohing and ahhing. The fashion director was smoking and looking bored. "She's French, I can tell," said Aler. Then the girls followed us to try to get into the White Swan but the doorman would not let them go in. I can in and out of White Swan with ease. Even looking as grungy as I do. A white gloved uniformed man helps me out of the taxi and says, "Welcome to White Swan." Another uniformed man opens the door for me. Another man gets the elevator for me. A girl could get used to five star living real quick!! Ok, now I take you to a special tradition at the White Swan Hotel. 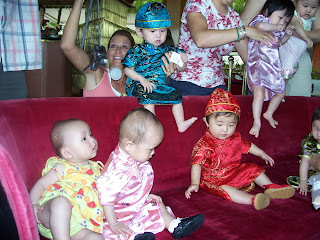 The babies get dressed up in traditional Chinese dresses and pose on the Famous Red Couch. How did this start? No one at White Swan even knows. They think we are nuts for doing this. Especially because the red couch in question has faded to a dull pinkish color. There are about 6 or more red couches in the White Swan. No one knows exactly which is the famous one. We only knew because another adoption group were being photographed there. But there's two across from one another in this lounge and both have seen better days. So which is the famous one? The group chose the one by the birds. 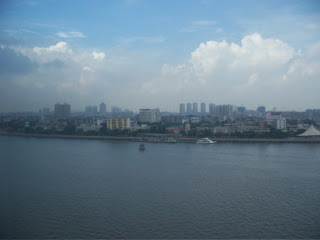 Whereas I think the one in front of the river view would have been more stunning. The couch is located on the 2nd floor, beyond the lobby. There is a small open air lounge that overlooks the river. It's hotel guests only and there is a bar area. There is also a large bird cage filled with love birds. today one of the birds was out of his cage. There are other brand new, deep red couches near the bird cage. But the FAMOUS red couch is the most beat up one of them all. Gee, wonder why! Miss Thang smiles on the couch before the other families arrive. 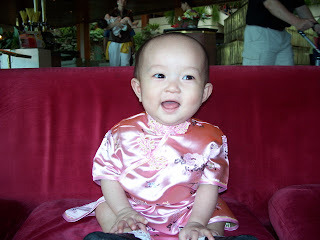 She is wearing a pink dress we bought in Hong Kong. 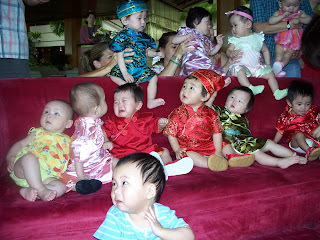 The mommies frantically assemble the babies on the red couch. The following pics are the progression from assembling to breakdown. Juna is the second baby from your left, seated on the couch. Juna is trying to comfort the baby in yellow next to her. she keeps patting the baby's head, which is pushing the baby over. Juna is now attempting to comfort both babies next to her. She completely knocked over the baby in red. We think she was sick of sharing the spotlight. She did not cry once. She was more interested in consoling her couch mates. 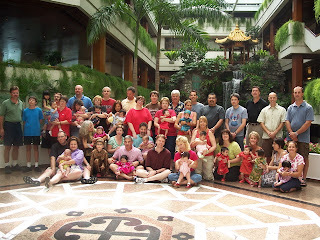 Here is our entire group, assembled on the level between the second and first floor, overlooking the water fall. Have not read your posts yet - but man oh man do you have a beautiful little girl and that outfit is adorable! Hi - You may like the Cow and Bridge. Might be worth a try? I had basic noodles with pork. The spring rolls were good too. The restaurant across the street and to the left when you go out of the hotel is good. Not the one with the alligator in the cage or all the seafood swimming around. In between I think. Right across the street from Lucy's. We went there for our CHI group dinner. Every club sandwich I tried sucked - including Lucy's. I know you don't want it - but the fried crud at Lucy's was not bad at all. Like french fries, chicken strips, etc... Seems like a cop out - plus unhealthy - but by that point a little french fry tasted pretty good. Looks like you found Starbucks. Tastes pretty darned good huh? In Hong Kong we went to a little coffe house in the IFC mall called MIX. I wonder if there is one in GZ? It was so so so awesome. Too bad about your group members being unhappy. Man - you just have to expect to roll with the punches over there. Like you all have been doing. They should know better. Puts a damper on everyones trip. We had a jerk on our trip. I avoided him like the plague. Juna is just beautiful. I bet you feel unbelievably blessed. I can't wait to meet her and see you guys. I can't believe you will be home in 2 days! Hell - have fun on the plane ride home. BENEDRYL. That and bulkhead seating. Or maybe an empty plane. We never had an empty plane - but others did. The ride home always feels shorter than the ride there right??? At least you will have the girls waiting at this end for you and the ride will end eventually - although it sure doesn't feel that way when your on that plane does it? I can't believe Juna becomes an American on the 4th of July. How amazing is that. I'm guessing you have some sort of patriotic outfit for her to wear? I was really emotional on the way home. CONGRATULATIONS!!!!!!!!!!! You are almost home! I hope you have fun your last few days. !!!!!!! So exciting! Mae, If I'm not mistaken that's the first "full length" photo of you I've seen since your dinner theater days. You're lookin good Dear! Awesome photos!! Thanks for sharing SO much. Pictures and experiences. Are there some baby boys in that photo? And a question, I think you told us this, but do they try and match baby personality to the parents' personalities? Hey, odd thought about the laser shows....... would they blind you if you look directly at them? Kinda odd to be swinging them all around the place. And why do they do this? Is it simply the equivalent to Vegas as you said? I am sorry to hear about the smoking. I can imagine how that person must feel. Darn people and their inconsideration. I wish I could live in a more laid back country! I'm kinda sad your China experience is coming to an end. It was just as exciting for me to read! Being a theater person, you'll get what I mean of course.